Have you ever heard someone say, “I’m just not a math person?” When I was younger I used to say it all the time, and I hear it all the time from our students (though less and less these days). A lot of people have the idea that you’re either good at reading books or you’re good at numbers, and it’s not possible to do both things well. Those people have it wrong! 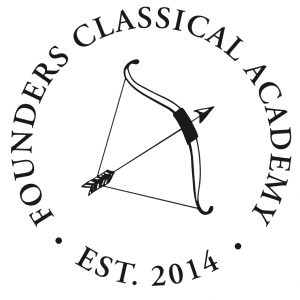 Classical education is a liberal education, a well-rounded education, and done right, it teaches students to love knowing things–things about numbers, things about letters and sentences, things about the past, things about the present–and the curiosity to keep searching for knowledge long after the school years are over. At Founders we strive to cultivate in our students a desire for knowledge of all kinds and the virtue to use that knowledge well. Why is it that you rarely hear someone say, “I’m just not a reading person,” or, “I’m not really a science person?” Why is it always math? We have a few ideas about that, and we chose Singapore math in the grammar school because we think that over time it will teach our students to be math people because they are knowers. We think that many math curricula fall short, and that we are doing at Founders can create confidence and even enthusiasm about mathematics. We chose Singapore mathematics because it’s designed around one simple but essential thing about math instruction: Mathematical concepts have to be taught in a certain order. You have to walk before you can run, you have to crawl before you can walk, and you have to learn addition before you can learn subtraction. No matter how intelligent a student is or how talented his teacher is, he cannot understand the concept of subtraction before he understands the concept of addition. Knowledge of subtraction assumes knowledge of addition. Multiplication comes next, and after that comes division. It has to go in that order–that’s the rational way of learning it. You can see that a subject like literature is very different–it doesn’t really matter if you read A Tale of Two Cities or Great Expectations first–if you read both of them you will get a pretty good understanding of Charles Dickens as a writer either way. But math is different–it’s got to be taught in the right order. Now, all math curricula understand this about the basic mathematical operations, but many forget the order in which math concepts should be taught when it comes to more difficult things, like fractions, or even more abstract concepts, like those taught in Algebra. Learning math is like building a skyscraper. The first story is addition, and the second is subtraction, then multiplication, and then division, and so on. A lot of students go into building the floors with a slightly shaky understanding of division, for example, or (even more common) having understood multiplication as a concept but without memorizing their multiplication facts. When they get to the next levels, which involve dealing with fractions, that difficult concept is made more difficult by the fact that their multiplication level is only partially built. And until you go back and fix that multiplication level by memorizing those math facts, it’s going to be a gap and cause problems when the student learns a new mathematical concept that requires the use of multiplication. By the time a student is in pre-Algebra or Algebra, there are dozens of stories to his math skyscraper, and if they are all solidly built, he can sail through difficult equations that require him to solve for x, and y, and even z. But if those multiplication facts still aren’t there, or if he never really understood the concept of squaring a number, that little gap is going to be there and it’s going to be making things difficult until he goes back and learns it. That means that elementary math education is crucial for future success. We chose Singapore Primary Math (the U.S. edition) because we think that it teaches all of the concepts that must be covered up until Algebra in the correct order, without creating accidental gaps in the skyscraper and while giving students enough time to build each level well before they have to move away from it for good. So how does Singapore math do it? 1. It teaches students mathematics at the conceptual level rather then by having them memorize a procedure for each type of problem. When I was in school, I was a memorizer of procedures. I learned to recognize a problem that looked a certain way, and to follow a series of steps that the teacher laid out for me each time I saw a problem that looked like that. I always got the right answer, but I never really understood what I was doing or why I was doing it. Singapore asks students to use the same concepts over and over, but it asks the question a different way each time so that they can’t memorize how to get to the correct answer–they have to think it all through at the deepest level. This yields a true understanding of the concept and the ability to actually use it for actual thinking, rather than for just getting a good grade on math homework. 2. As you can see, Singapore math is very visual. We use math manipulatives in the early grammar years, and for older students we use bar modeling for concepts that can’t easily be represented with physical objects. Seeing and using something physical while thinking helps students to remember that mathematics is made up of a bunch of symbols, and they have to remember what the symbols represent to really understand math. Parents are often frustrated when helping students with their math homework because they are used to a certain way of solving problems and they want to teach their child the procedures they learned when they were in school. This is very well-intentioned, but it can be counterproductive with a student in Singapore math. If you would like to help your child at home but don’t have time to learn the Singapore method, we recommend that you help your child memorize math facts at home. Knowing times tables by heart and being able to remember quickly what 9 times 7, 9 times 6, 9 times 5, and so on are is an invaluable tool. And math facts present the opportunity for exciting competitions between student and student–or even student and parent! Try it if you like. If you’d like to learn more about Singapore math, please take a look at the books listed on our website under Resources for Parents. And remember–math doesn’t have to be daunting. A student who “isn’t a math person” can become a math person with the right instruction and the proper tools.